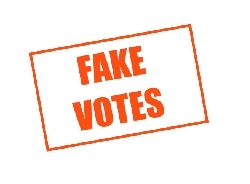 FAKE VOTES « THE BRYCE IS RIGHT! – First we had Fake News, now we have…, a bigger problem. There is an old axiom in poker which says, “When your opponent is sitting there holding all the aces, there is only one thing left to do, kick over the table.” In other words, if you know you cannot possibly win, it is time to change the rules of the game. Coincidentally, this is the philosophy of progressive Democrats as we approach the 2018 mid-term elections, particularly as it applies to voting. There was a time when we respected the integrity of a citizen’s vote. Originally, only land owners were given the right to do so, based on the premise they would be responsible voters. This changed over the years to allow any citizen to vote, assuming they were registered. This included people of all races and socioeconomic conditions, women, and even youth (18 years of age). The electoral college devised by our founding fathers is a brilliant way to balance voting between our rural and metropolitan communities. By doing so, candidates are forced to appeal to both groups, not just one. However, the Democrats do not appreciate this (or understand it) as they blame the college for electing Mr. Trump president, and not Mrs. Clinton who won the national popular vote. To overcome this problem in the future, the National Popular Vote Interstate Compact was created to have a state award its electoral votes to the candidate winning the popular vote in the country, not their own state. Even if the popular vote in the state went to one candidate, they would have to award their electoral votes to possibly another candidate winning the national vote. In other words, you are allowing the country to make the decision for you, not the people of your state. If this sounds unconstitutional, it probably is and will likely be challenged in court. To date, eleven states and the District of Columbia have passed legislation to participate in this program, including: California, Connecticut, Hawaii, Illinois, Massachusetts, Maryland, New Jersey, New York, Rhode Island, Vermont, and Washington. Yes, these are all strongholds for the Democrats, certainly not Republicans. I will find this all particularly amusing if Mr. Trump wins the popular vote in the 2020 presidential election, whereby they would be compelled to award their electoral votes to the president, and not the Democrat candidate they voted for. There is a movement afoot to give felons the right to vote. We have seen evidence of this in New York, Louisiana, and Virginia, but many other states are looking into this, including Florida. The premise is to allow convicted felons, who have been released and are still on parole, to vote. In other words, their sentence is not yet completed, yet Democrats want to give them the right to vote. It’s one thing for the criminal to regain his/her rights following completion of their sentence, quite another to be allowed to vote while under such term of sentence. The Democrats are pushing for this as they believe it will cause the criminals to vote for their candidates. Voter identification has long been a bone of contention between Democrats and Republicans. Whereas the GOP wants to assure the integrity of the vote, Democrats claim it is a racist attempt to prevent minorities from voting. One new twist to this recently emerged in Chicago which has produced a new identity card available to anyone, including illegal immigrants, allegedly to allow residents to use public transportation. However, it has been confirmed the new card will be accepted as identification when voting. In other words, you do not need to prove your citizenship in order to vote in the City of Chicago. Watch for other cities controlled by the Democrats to follow suit. Back in 1970, the voting age was lowered from 21 to 18. The thinking at the time was that if a young person was old enough to serve in the military, he/she should be allowed to vote. At first, this was embraced by young people, but over the years, their voting record can be described as “spotty” at best. However, a new movement is underfoot with the Democrats attempting to lower the voting age to 16. It is slow in taking root, but the Democrats became inspired following the recent march on Washington in support of gun control by young people. The big question of course is whether 16 year olds are knowledgeable and mature enough to vote responsibly, or will they just be a pawn of the Democrats and news media. Frankly, I’m surprised they stopped at 16, and didn’t seek the vote of 12 year olds for the same purposes. Again, this is all being staged to embrace the ideology of the Left and secure votes for Democrats. Shortly after assuming office, President Trump appointed the Voter Fraud Commission chaired by Vice President Mike Pence. The purpose was to investigate voter fraud. Unfortunately, states controlled by the Democrats resisted and refused to hand over data from the 2016 Election to the commission, thereby making it impossible to verify any wrong-doing. So strong was the opposition by the Democrats, one could only suspect something was indeed wrong. Nevertheless, because of their refusal, Mr. Trump cancelled the commission in January. It appears to be rather obvious the progressive Democrats are desperate for a win in the Fall. As I have said repeatedly, their future is in peril should they lose in either chamber of the Congress this year, which is why they are pulling out the stops and going to any lengths to win. This is so flagrantly obvious, it makes you wonder why there isn’t a national uproar over this. They are not interested in winning fairly and squarely, but any way possible, legal or otherwise. In other words, they are willing to kick over the poker table instead of suffering through the embarrassment of another loss. Let’s hope American voters wake up to this soon before we no longer recognize the American electoral system.